What is wrong with my 3D DCT quantization? 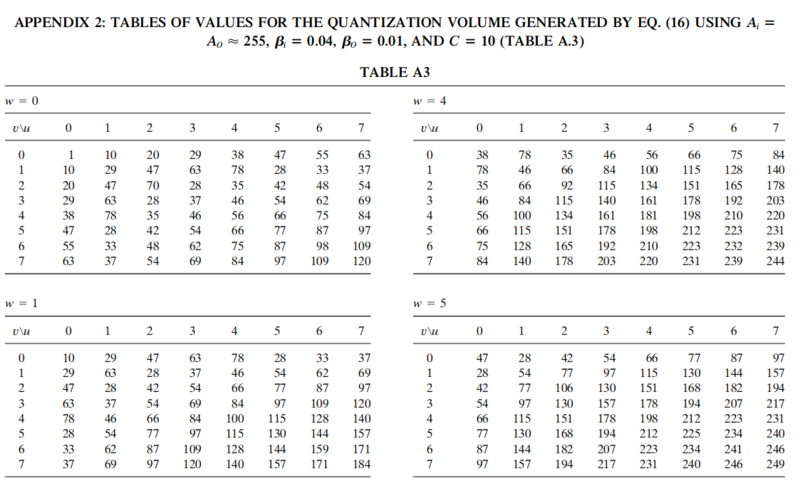 But applying this table to my DCT produces horrible results, depending on normalization. Between my DCT and inverse DCT, I inserted the following snippet, where cubes contain the DCT coefficients and qtable is as above. And even myqtable = (qtable*8), with a range between 999.0 and -990.0 (11 bits) looks worse than downscaling to 6 bits. The authors of the paper seem to use 8 bits, which is what's shown in the worst picture above. So clearly something is horribly wrong. I'm kind of losing my mind at this point. What seems especially odd is the horizontal lines at the 8px boundaries and the overflow to white (output is clipped at 0-255). Nothing about the code or the table suggests dependence about a particular axis. My DCT is implemented as a row-column-frame application of Loefflers algorithm. Any idea or suggestion is greatly appreciated. Browse other questions tagged dct quantization video-compression or ask your own question. In image compression using transforms, how to deal with the transformed coefficients as they are not integers? How to determine a quantization table for image compression with DCT?